There are a number of reasons you might want to use non-chicken eggs in cooking (allergies, taste preferences, availability), so in our first installment on examining the use of non-chicken eggs, we will quantify some of the differences between chicken, duck, and goose eggs. Initial observation: It has been noted that substitution of duck eggs for chicken eggs (from friends, and generally by others online) in a recipe can lead to different results in terms of texture and flavor. The eggs of these different fowl vary in size based on the individual laying bird, but general size trends also seemingly hold between species. Question: How does the egg volume, and ratio of yolk to white vary between eggs of these different species? Expectation: There is an obvious size difference between the chicken, duck, and goose eggs, thus, a distinct volume difference is expected. Having worked with duck eggs before, the ratio of yolk to white is expected to be greater than the chicken eggs, and it is expected the goose eggs will be similar to the duck versions. One duck egg brought to the Primary Testing facility was very tiny (see photo), but the internal ratio is expected to be duck-like. Variation in egg size from small (a tiny duck egg) to large (2 goose eggs). The bright white eggs are standard chicken eggs from the grocery store. Note: the data for the tiny duck egg was discarded, as the yolk was not properly formed (just a few yellow blebs in the region that should have been a yolk). Data in Harold McGee’s book (On Food and Cooking: The Science and Lore of the Kitchen ) indicates that the average U.S. Large egg has an internal content mass of 55 g. Of that mass, approx. 31% is the yolk and 69% is the white. 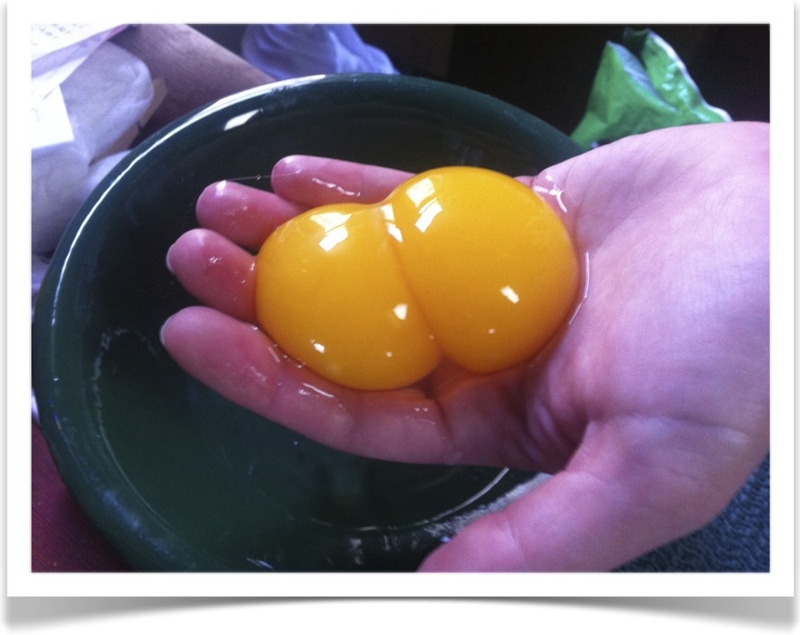 Thus, an idealized Large chicken egg has a yolk:white ratio of 0.45 : 1. This is actually in pretty good agreement with the two standard chicken eggs measured, where ratios of 0.45 and 0.55 were obtained. 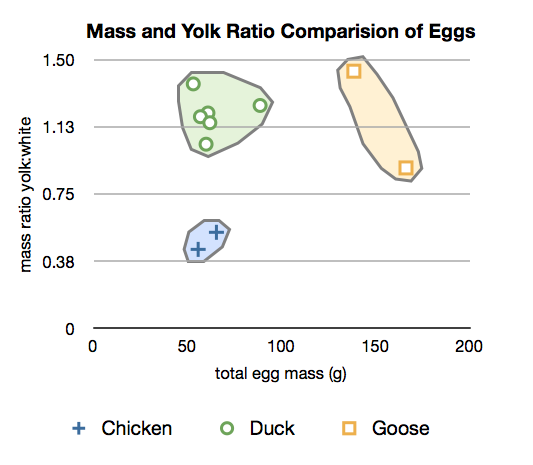 As can be seen in the plot below, the chicken, duck, and goose eggs are easily distinguishable when the total egg mass and yolk:white ratios are used for axes. Standard, large, chicken eggs are about the same total mass as the duck eggs, but the latter are significantly more yolky. Goose eggs are significantly larger overall, but have a similar yolk:white ratio range as the duck eggs. Plot of total egg mass in grams versus the yolk to white mass ratio. The chicken, duck, and goose eggs plot in distinct regions. Surprise Results: Double-yolked goose egg! Conclusion: As suspected, the goose eggs are fairly similar to duck eggs regarding the prominence of the yolk in terms of % of internal mass. Both the duck and goose eggs have significantly more fat and protein compared to the chicken eggs. This makes sense given the greater yolk:white masses as shown in the data collected here. The protein content of the duck (and presumably?) the goose egg whites is also noted to be higher than in chicken eggs. All those eggs were the equivalent of 12 standard chicken eggs. 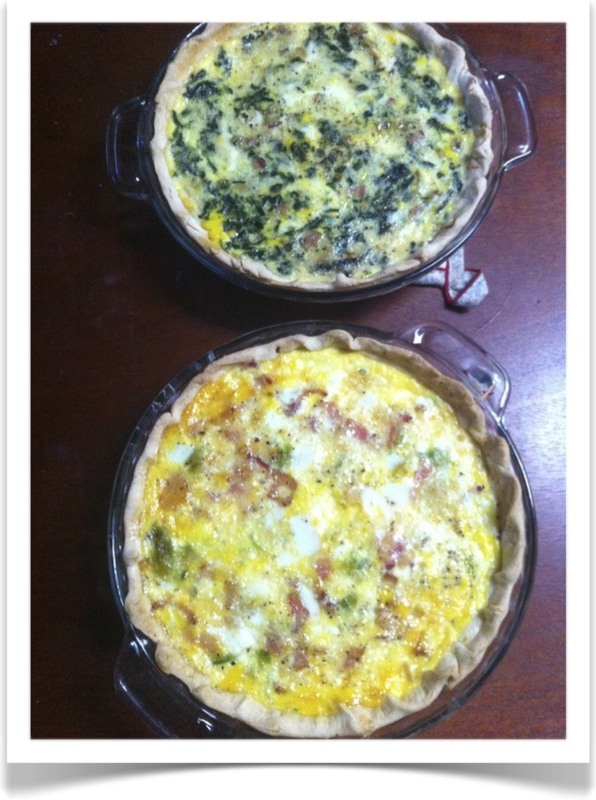 That equals 2 quiches! Given the differences in yolk:white ratios, how does the substitution of duck or goose eggs for chicken eggs 1:1 by volume change egg-based food stuffs? If meringues are more stable when made with duck eggs due to the differing protein content (as mentioned in a blog below), could this be a benefit in co-blogger’s family dessert recipe “chocolate crunch”? Audet, M. April 6, 2013. “Why Duck Eggs Are Charming Chefs in 2013“. Culinary One Blog. O’Connell, D. Feb. 16, 2013. “Duck Eggs vs Chicken Eggs in Baking“. 101 sweet pastry: changing the world bite by bite. Velden, D. April 26, 2011. “Recipe: Duck Egg Sponge Cake with Cream & Strawberries“. theKitchn. Walbert, D. July 1, 2008. “Duck eggs: A primer“. the New Agrarian.